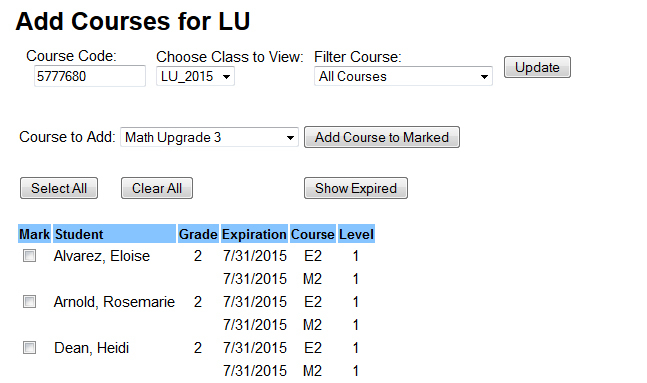 The Courses Tab will be the tab you’ll use to make any changes to Learning Upgrade courses on a student account. To Navigate to the Courses Tab, click the Courses Tab link at the top of your screen. Below you will find a table of contents for options in the Students Tab. To view individualized reports for each student course, click the Report button in the row corresponding to the student and course of your preference. The Student Summary Report page will open. The first table in the report will focus on Subject Area Scores. The second table in the report will focus on the individual level scores from a course. The blue lines in the table show the initial score on a level, with the orange lines showing the high score. The final table in the Student Summary Report will give you a breakdown of each individual level within a course. 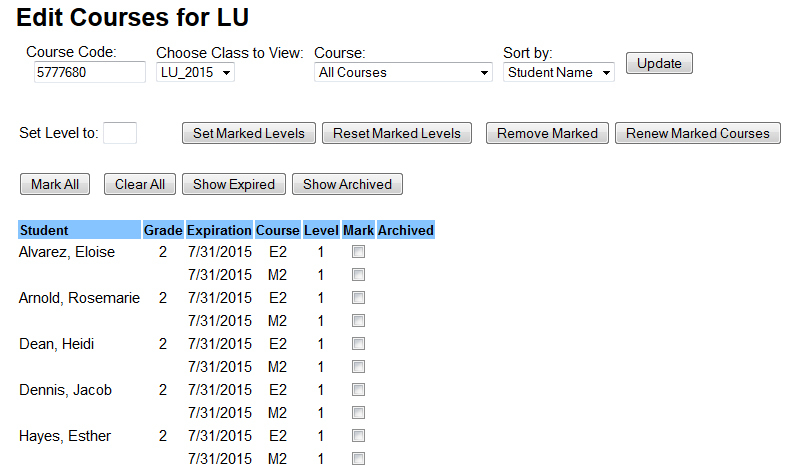 To remove a course from a student, click the Remove button in the corresponding row. To remove a course from every student in your class, click on Edit Courses. In the Edit Courses menu, you can select the courses for removal under Mark. To remove all courses, click Mark All. You can filter by course under the drop down menu for Course. Once you have selected the courses you would like to remove, click Remove Marked. To renew a course fom a student, click the Renew button in the corresponding row. To renew a course for every student in your class, click on Edit Courses. In the Edit Courses menu, you can select the courses for renewal under Mark. To renew all courses, click Mark All. You can filter by course under the drop down menu for Course. Once you have selected the courses you would like to renew, click Renew Marked Courses. To add a course to every student in your class, click on Add Courses. In the Add Courses menu you can select a course with Course to Add. Once you’ve selected a course, you can select individual students under Mark or add the course to your entire class by clicking Select All. To add the course to your selection, complete the process by clicking Add Course to Marked. All of our courses start at level one and require a student to work through the course one level at a time. If you would like to skip a student ahead in a course, click Edit for the course you would like to advance the student in. In the Edit Course menu, type the desired course level into the field for Course Level, then click Update Course. All of our courses start at level one and require students to work through the course one level at a time. If you would like to skip multiple students or your entire class ahead in a course, click Edit Courses. In the edit courses, select the courses you would like to advance under Mark, or click Mark All to select all courses in your class. Type the desired course level into the field for Set Level to, and click Set Marked Levels.